Miniature folding screens by Bespaq, they can be upholstered with your choice of fabric. available in fruitwood, walnut, mahogany. 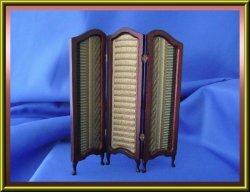 Screen shown $115.00, please specify your finish choices in the coment section of your order.